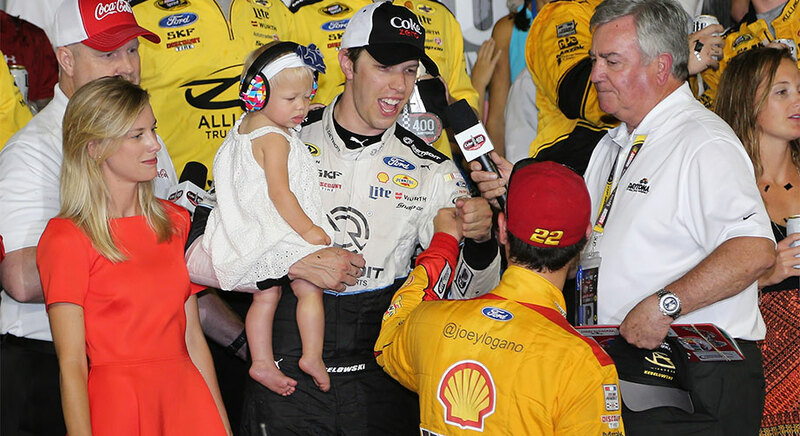 Editor’s note: The following article was written by Team Penske driver Brad Keselowski. 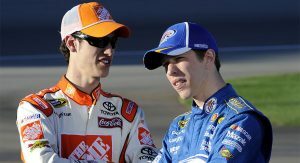 The first time I heard of Joey Logano, it was from the Prospect List. If you don’t know what the Prospect List is, it’s basically like ESPN’s Mel Kiper NFL draft board, only for NASCAR. Back in the day, when Joey and I were just getting started, Joey was always near the top of the Prospect List, always number one, two or three. I, on the other hand, was never on it. So I’d always see his name on there, and I definitely was jealous, mostly because I couldn’t even crack the List, let alone get to the top of it. And if I’m being honest, I definitely felt a bit of animosity toward him, being someone who wanted to beat the best, and be the best. At a race in 2008, Joey was making his first NASCAR Xfinity Series start, and in practice, he pulled out in front of me when I was right in the middle of running a simulated qualifying lap. I was going really fast, and he drove out right in front of me at half speed. I had to lift and slow down, and it ruined my whole lap. So I gave him the finger. That was how I met Joey Logano. I wouldn’t actually speak to Joey for the first time for another two or three years, but not long after that first “meeting,” we both got Cup rides. He’d get a full-time Cup car in 2009. I didn’t have one until 2010. It was over those first years, as Joey and I made our way into the Cup Series, I started to gain respect for him. But it wasn’t until 2011 that we started to build a kind of relationship. That year, we both had Cup rides with fairly prominent teams, and we both were kind of struggling. We had some mutual disappointments on the race track, and felt that what we were doing wasn’t working, and that we were in trouble. It was easy to grow a bond over that. As part of the new guard, and we had little to no support structure around us from our peers. With Joey — at least in the beginning of the relationship — we were like two roommates who’d just moved to the big city. “How was your day at work?” “It sucked. You?” “It doesn’t feel like I’m going to make it.” “Me either.” That’s a lot how it felt in the beginning. We both had our backs against the wall in terms of our careers. Then came the race at Sonoma in 2011. Both of us were in our second year in Cup, and we were having dismal seasons. When you’re in your sophomore season, expectations go way up, both internally in your team and externally from everyone else. And we both were struggling. So we both go to Sonoma, which is one of the toughest tracks on the circuit. He qualified on the pole. I was the fastest in practice. And while it wasn’t a win for either of us, it gave us both hope. I remember sharing that feeling with him, that we both felt like, “Yeah, we can really do this.” We really bonded over that. Joey continued to run the Xfinity and Cup Series, just like me, and we continued to compete against one another. Our friendship grew, too. As time passed, I began to see — even more than I had before — that he had a ton of talent. We got along well. He was young enough and respectful enough where the two of us could interact together. At the same time, it became clear during the 2012 season that Team Penske was going to need a driver for the 22 Cup car for the following year. I started to think about what Joey might be like as a teammate, and I felt he might make a tremendous asset for anyone who had him on their team. He wasn’t a partier, which I thought was important. When you have someone who is a partier, it’s hard to build the respect and continuity you want in a teammate. You wind up carrying a lot of weight in terms of the direction of your overall program. Joey had the highest degree of professionalism. He took his job seriously. So in the late summer of 2012, I told Roger Penske that without a doubt, Joey was the guy they needed to hire. I’d seen him on the race track. I knew the moves he could do. I could work with him off the race track. I’d started to build a relationship with him. This was the guy. Roger took it under advisement, and interviewed Joey and a few other drivers. When all was said and done, they were basically on the fence between Joey and some other choices. In the fall of 2012, they hired him. As I grew to know Joey, I really started to appreciate his values as a person. He’s big on family. He’s a fairly spiritual person. He has a pretty high level of ethics. Over time, his wife and my wife became very close friends, which is a great thing. I also came to value him as a teammate. We found ways to help each other out, and shared strategy — as much as two teammates who are competitors can. My thinking has always been that I’d rather come in second to a teammate who I’ve shared information with than be part of an overall weaker racing program, but beat my teammate and finish 10th. After Joey unloaded his car at Homestead and wasn’t very fast in practice, I’ll be honest — I didn’t think his chances of winning the title were good at all. In fact, until Joey took the lead late in the race, I still didn’t think he had any chance at all of winning. And until there were four or five laps to go, I didn’t really believe he was going to win it. It was quite something to watch, and a huge moment to be a part of. It also showcased exactly who Joey is: The kind of driver who has the ability to rise to another level when the pressure is greatest, and come through with a win. Call it clutch, call it whatever you want — whatever “it” is, Joey Logano has it. I could not have been prouder of Joey for winning the NASCAR championship, or to be his teammate and friend. He deserved to win back in 2015. I’m not going to lie: As a competitor, seeing someone else win the title always hurts a little bit because you share the same aspirations as the person who wins. But in other ways, I was incredibly thankful that it was Joey — who, incidentally, started racing when he was 5 — who wound up in Victory Lane. In our time together, I’ve seen firsthand how hard Joey worked to get there. I know how good a person he is. I’ve watched him grow from an upstart to a winner, from a clueless bachelor to an amazing husband, and now, father. He’s excelled in every aspect of his life. So it only seems fitting that he should add one more accomplishment to the list: Champion. No one is more deserving.